Dr. Jackson directs informatics efforts at ARUP, including ARUP Consult®, charting, and software product management. He is the medical director for Business Development, Support Services and IT at ARUP and an associate professor of pathology (clinical) at the University of Utah School of Medicine. He received his BA in mathematics, his MS in medical informatics, and his MD from the University of Utah, and completed a clinical pathology residency at Dartmouth-Hitchcock Medical Center. 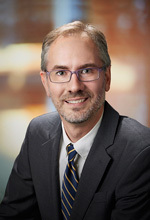 Prior to his employment at ARUP, Dr. Jackson was a staff clinical pathologist and informaticist at Dartmouth-Hitchcock Medical Center, a product manager for a Belgium-based medical software firm, and a National Library of Medicine informatics fellow at the University of Utah. Dr. Jackson’s research interests include economic analysis of diagnostic testing, physician utilization of laboratory tests, and corporate social responsibility in healthcare. He is certified in clinical pathology by the American Board of Pathology. Read more about the ARUP podcast Dr. Jackson hosts, LabMind.